There is nothing more refreshing on a hot day than a glass of ice tea. It is a very frugal drink if you brew it yourself. All it takes is three tea bags, in a tea jar full of water, set in the sun for a couple of hours. You can also brew it on top of the stove. It is the flavoring that adds the expense! I love the peach tea and raspberry tea served in restaurants. 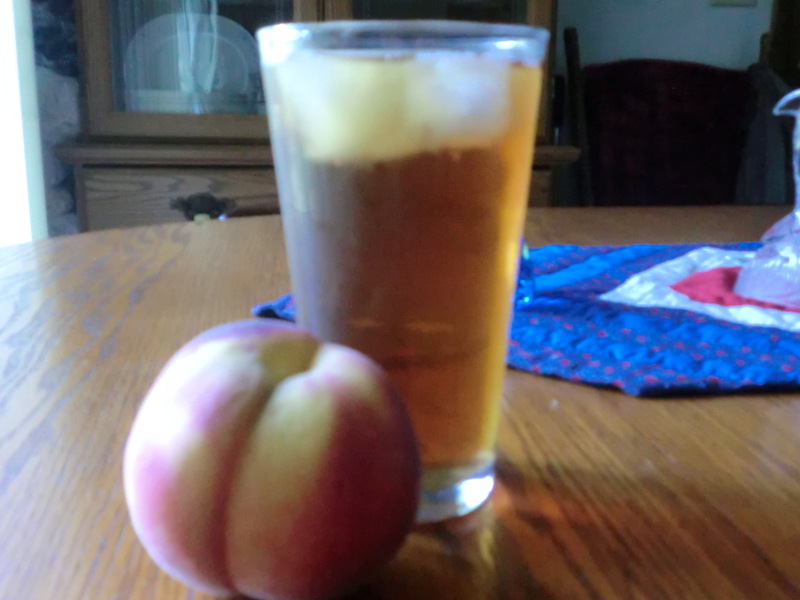 The little slice of peach makes you think you could have the same flavor by adding a slice of peach to your tea at home. But restaurants use peach flavored syrup. Some restaurants will even sell you a bottle of the syrup for around twenty bucks. I have found a frugal alternative!!!! You can buy canned peaches in “heavy syrup”. That heavy syrup is what you need to make peach tea. Save the syrup and add a little to your glass of tea. This is a treat you don’t want to have every day because of the extra calories. If you prefer raspberry tea, I’ll pass along the tip I read at Debt Proof Living, a couple of years ago. When you brew your tea, add a Raspberry Tea Bag. You can buy boxes of Raspberry Tea Bags. My son bought me an ice tea maker, but since I don’t have an ice maker in my freezer, I didn’t use it very often. Then my ice tea jar broke. I made the tea without ice in the maker. It was really concentrated, so I put it in a pitcher and added water. I think I will always make it this way when I want to make sweet tea. I put a scoop of sugar in the bottom of the ice tea maker pitcher before I brewed the tea without ice. The hot tea helped dissolve the sugar. This entry was posted in Food, Make It and tagged Food, Make It by Frugal Fish. Bookmark the permalink.